The Office for National Statistics (ONS) recently published the results of its fifth annual survey of personal well-being in the UK*. So are we getting happier, and – more important – what can we learn from this? Well, the data shows a steady improvement in life satisfaction, happiness and ‘feeling things are worthwhile’ since 2011 – although not significantly over the past year for the latter two. ‘Anxiety’ actually got slightly worse last year, although again not to a significant degree. But taken over the five years since 2011, yes apparently we’ve been getting happier. The headline figures are averages, so don’t show ‘polarisation’ (i.e. whether the number of both high and low scores is increasing). However, supporting analysis indicates this is not happening. At least at national level, fewer people are reporting the lowest levels of life satisfaction as more people report higher levels. Regional analysis shows Northern Ireland at the top of the “happiness league” and London at the bottom, although the difference is small. So what’s behind all this? ONS’s own research suggests a combination of personal factors (health, employment, relationships) and external factors (the economy, security) as the main contributors. The 2016 survey pre-dates both the EU referendum vote and more recent terrorist violence, so it will be interesting to see whether these affect trends next year. 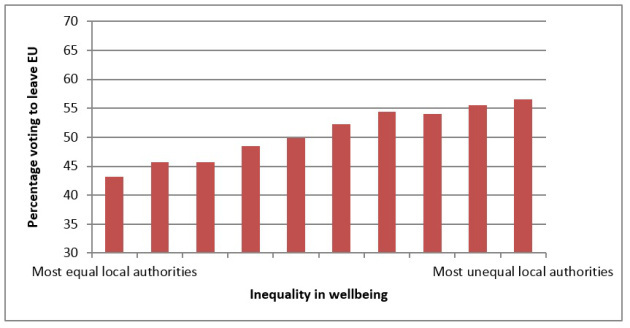 However, a recent blog for the What Works Centre for Wellbeing** raises an interesting correlation, not about well-being per se but about local inequalities. Its graph, reproduced here, suggests that more ‘unequal’ local authority areas – i.e. those where there is greater polarisation – were more likely to vote to leave the EU. This is consistent with the theory that those who feel disadvantaged are more likely to want change, expressed in this case through the Brexit vote. And it is perceived disadvantage, rather than more tangible aspects such as income disparity, that matters here – which is what well-being measurement captures. The blog concludes that “more research will be needed”, a common get-out for researchers but in this case I agree. Lots of arguments have been made (after the event of course) as to why Brexit won, and this is just one idea. But for me, the underlying question is not why people voted to leave the EU but why the result came as a surprise. Did we really fail to understand people’s attitudes to this degree? I’ve commented before on the need to understand cause-effect and address well-being issues more prominently in government policy, and I believe this is more important now than ever. As a society we need to understand why people vote – and indeed act – as they do, and tackle the underlying causes of discontent. Because if we don’t, then Brexit may be the least of our worries.